The complete audio version of all 66 books of the Old and New Testaments New Testament is narrated by Eric Martin renowned actor, narrator, journalist, writer, radio broadcaster and defender of persecuted Christian minorities, recorded on 60 CDs. Plus a second complete audio version of all 66 books of the Old and New Testaments is narrated Alexander Scourby, The Gold Standard of Bible Narration on 2 MP3 CD Discs. 2 Complete King James Version Audio Bibles by 2 of the best Bible narrators for the price of 1. Alexander Scourby and Eric Martin's love of God's Holy Word shines through their voices. Two of the world's most gifted artists each narrate a Complete King James Bible, the most popular book of all time. Alexander Scourby is known by many as The Voice of the Bible. Talented Christian Actor Eric Martin is a renowned actor, narrator, journalist, writer, radio broadcaster, worldwide defender of Minority Christians. Eric has received both National and International awards and honors as a narrator.. You will experience all of the stories, events and teaching of The Complete Audio Holy Bible on compact discs as well an MP3 Discs. Be uplifted, encouraged and motivated by the Word, as every syllable of the King James Old and New Testaments are brought together to life by Alexander Scourby and Eric Martin, providing hours of inspirational listening. Included is a durable padded, zippered case with individual sleeves for each of the 62 discs. All of the 62 Discs are covered by a Limited Lifetime Warranty. Casscom will replace any scratched or damaged discs free of charge. You pay only a shipping and handling charge. Enjoy the Word, as every syllable of the King James Old and New Testaments are presented by 2 of the best Bible narrators. Alexander Scourby and Eric Martin. They provide you with more than 120 hours of inspirational listening. Alexander Scourby's Narration of the Old and New Testaments is provided on 2 high quality digital MP3 Discs. 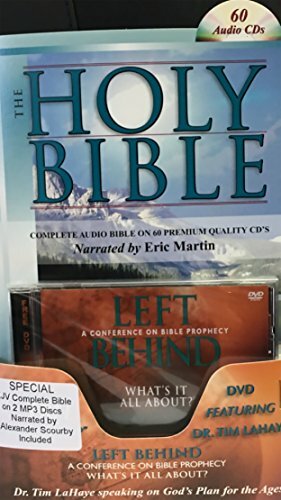 Eric Martin s Narration of the Old and New Testaments is provided on 60 high quality digital Compact Discs. The 60 Eric Martin discs are printed with 60 different full color Majestic images from around the world, capturing the power and beauty of God's majestic creation.